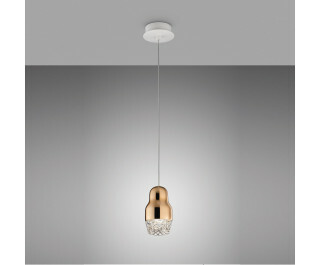 Fedora designed by Dima Loginoff for Axo Light is a beautiful suspension lamp available in 5 different types. Fedora's diffuser is formed of a part in metallized aluminium and another part in transparent glass. The aluminium part can also be varnished with 3 different finishes: rose gold, bronze and chrome. Protection Index IP 20.